Interventional pain management in animals is an application of image-guided procedures which beneﬁt veterinary patients with both acute and chronic pain. Pioneering work in human pain management has led the way not only for perioperative nerve blocks, spinals and epidurals, but also for trigger point injections, peripheral nerve and nerve root branch blocks, sympathetic plexus blocks, intravenous infusions, radiofrequency lesioning, botulinum toxin injections, intra-articular and peri-tendinous injections, and spinal or epidural “desensitizing” implantations. These procedures are indicated for a variety of acute, chronic, oncologic, degenerative, and post-traumatic painful conditions. Although some patients respond to interventional procedures as uni-modal therapy, most chronic pain patients respond best when such interventions are part of a multidisciplinary approach (usually coupled with physical rehabilitation and the use of balanced medications). Interventional procedures may be therapeutic or diagnostic, the latter of which are administered to determine if pain is part of the disability, or if an anatomical area is the correct focus of treatment. 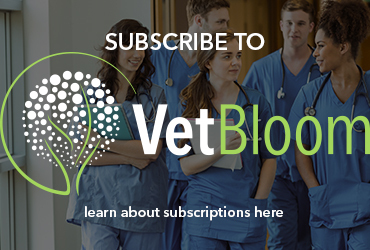 Surgical, acute local and regional blocks like epidurals and surgical nerve blocks have been widely utilized within the past decade for veterinary patients. In the veterinary acute or perioperative arena there is no need to question whether local/regional analgesia should accompany general anesthesia. Local blocks have become a basic premise of surgical general anesthesia. Local blockade permits reduction of inhalant requirements the latter of which is inherently safer for patients; high inhalant concentrations during surgery have been linked to postoperative cognitive, cardiovascular, musculoskeletal impairments. Local anesthesia permits comfortable and quick arousal from anesthesia with little potential for unwanted systemic effects such as sedation or respiratory depression; analgesia derives from sensory blockade which SPARES motor and sympathetic function. Recovery to mobility, appetite return, and cognitive function are vastly improved when local techniques are employed in the perioperative plan; morbidity is reduced. Lastly, local anesthetics are recognized to have many beneﬁcial effects beyond blocking nerve conduction, including broad anti-inﬂammatory effects (reduced production of eicosanoids, thromboxane, leukotriene, histamine, and inﬂammatory cytokines; and scavenging of oxygen free radicals) and even antimicrobial, antifungal and antiviral effects. All these effects of inexpensive lidocaine and other local anesthetics have been well documented in the human and veterinary literature for over a decade. Beneﬁts of interventional techniques in chronic veterinary pain management appear to be less evident than those of the acute pain arena, but they are indeed present! These techniques tend to be currently limited to epidural, intra-articular, peri-tendon, or trigger point indications and they have been historically more popular in large animal arenas than small animal practice. These blocks provide for improved analgesia and quality of life in a variety of chronic nociceptive and neuropathic pain animal models, problems and conditions. Local and regional blockades for chronic pain are immeasurably responsible for quality of life and return to function in the human population suffering with intractable postoperative, post traumatic, congenital, and especially oncologic and hospice pain. Important to note is that none of these techniques (nerve blocks for either acute or chronic pain treatment) are meant to supplant traditional medical or surgical diagnostics or therapeutics. They are intended to reduce pain and inﬂammation, enhance healing, and improve overall return to function, as well as quality of life in patients who have followed primary medical and surgical therapeutic routes. No epidural administered preoperatively will STOP the pain of receiving a C-section; however, it will greatly reduce the pain of the surgery and allow less inhalant use, two factors resulting in improved live delivery rates. Likewise, no joint injection (despite the anti-inﬂammatory properties and thousands of stem cells, healing proteins, or neurochemicals it contains) is currently capable of re-attaching two ends of a torn cruciate ligament or providing stability in ligamentous injury; it will however, assist with scaffold formation, reduced inﬂammation, improved viscosity and lessened C ﬁber irritation from joint capsular stretch, all factors which help to “heal” a sprained sitﬂe, whether or not a surgical ﬁx is attempted. Fig. 1: Radiograph of epidural catheter being conﬁrmed by contrast injection through catheter. Potential complications of locoregional techniques in veterinary patients include, but are not limited to, sedation or anesthesia complications, intravascular injections, inappropriate placement of intervention due to a lack of communication regarding the pain location, anaphylactoid or other drug reactions, enhanced pain from intra-neural administration, motor nerve or sympathetic impairment, infection and sepsis, catheter or substance migration, and mechanical injury to already damaged structures and surrounding tissue. Risk of any of these complications has been minimized with the use of imaging modalities in both veterinary and human patients. Two recent trials did not show any major complications, morbidity and mortality from interventional techniques in human patients (Fig. 1). 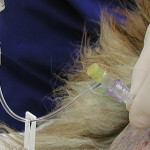 Although many interventional techniques in human patients are performed on “awake” patients, interventional techniques in veterinary patients often begin with some form of immobility, sedation and analgesia. 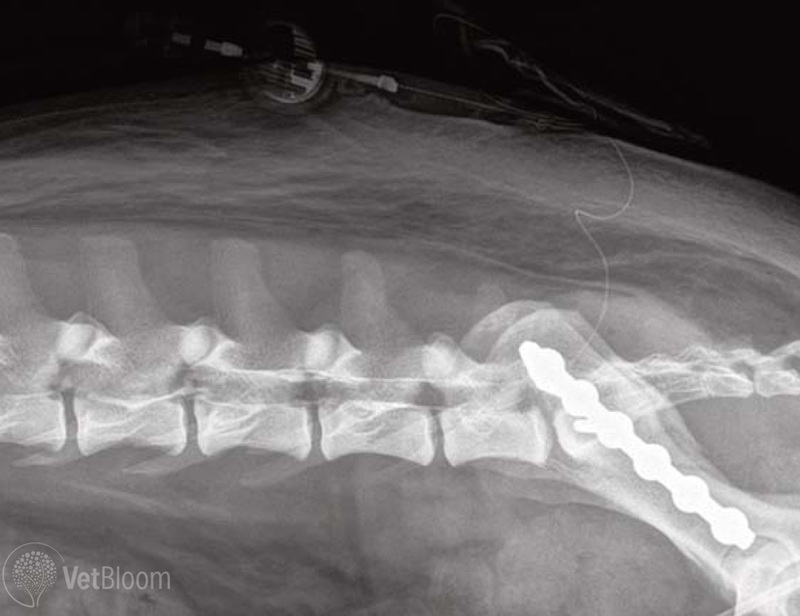 In veterinary patients, “conscious sedation” is a minimal necessity for interventional techniques in order to provide immobilization, positioning of imaging equipment, proper intervention placement, and analgesia for the disease and level of pain, let alone the intervention. I commonly employ a combination of opioid with dexmedetomidine and midazolam for small animal patients and detomidine or xylazine with butorphanol for large animal patients to provide sedation. This can easily be supplemented with low dose ketamine, propofol or inhalant anesthetic, but the latter are rarely necessary for most of the procedures that will be covered in part II of this series. * Following this, the use of a “test dose” of local anesthetic such as mepivicaine and lidocaine can prove helpful in identifying areas, distributions, or dermatomes of issue with the multiproblematic painful veterinary patient. Large animal practitioners commonly employ diagnostic nerve blockade; small animal practitioners should likewise embrace this modality as it would provide an invaluable and inexpensive means to diagnose musculoskeletal, as well as visceral or internal dysfunction. A variety of substances are used in interventional pain management techniques. Choice of agents and dilution are often unique to each blockade, and dependent on the target tissue (nerve, plexus, fascial, tendon, or ligamentous). Fig. 2: Intra-articular injection of platelet-rich plasma (PRP) in a canine cruciate patient. Steroids are commonly employed neuraxially, perineurally/periplexus, intraarticularly and within or around tendons. Triamcinolone acetonide is considered an intermediate acting (metabolic activity of 24–48 hours when given orally) glucocorticoid with no mineralocorticoid activity that is approximately 4–10 times more potent than hydrocortisone. When injected, duration of activity may persist for 4–6 (and sometimes up to 8) weeks. Opioids are commonly employed in interventional pain management in neuraxial and intra-articular techniques. Pre-synaptic mechanisms reduce transmitter release by inhibiting calcium channels. Post synaptic mechanisms are anti-nociceptive via induction of hyperpolarization secondary to activation of G-protein coupled inwardly rectifying potassium channels (GIRKs). Long-acting formulations of several opioids are produced by encapsulation into liposomes and tested in several models of pain (visceral, compression, heat induced) Liposomes can serve as a sustained-release carrier system, permitting the spinal delivery of large opioid doses restricting the dose for acute systemic uptake. Local anesthetics can be employed in almost all interventional techniques, although their use in intra-articular administration has recently been questioned due to chondrotoxicity potential. Regenerative and cell-based therapies seem most utilized when considering intra-articular or tendon based interventions in veterinary medicine (Fig. 2). Some argue that use of autologous biologic therapies such as cell based (embryonic and mesenchymal stem cells, ﬁbroblast and tenocytes), or factor based (platelet-rich plasma (PRP) and IL-1 receptor antagonist protein (IRAP)), has driven clinical usage to the point that it has outpaced, or perhaps even bypassed, scientiﬁc investigation into their use. Other substances and modalities have been utilized in interventional pain management with varying degrees of success and promise including ziconotide, ketamine, resiniferatoxin and botulinum toxin. Neurolytic blockade using alcohol, ammonium salts, phenol, glycerol, and hypertonic saline have all been utilized to produce wallerian degeneration when administered neuraxially or perineurally in patients with limited life expectancy, usually those suffering from intractable pain and cancer pain. Pain is a multidimensional experience formed by an ever changing neuromatrix; this complex array of peripheral and central components can no longer be addressed with the simple principles of parenterally administered drugs, even when multimodal therapies are considered. As veterinary pain management becomes more like human pain management in offering patients a broader range of strategies for the treatment of acute and chronic pain, the interventional strategies and the techniques to be detailed in part II of this series, will become more commonplace. *Part II of this series (to be published on Thursday, 12/10/15) will focus on strategies and techniques used in interventional analgesia for patients with acute and chronic pain. Brown D, Iadarola MJ, Perkowski SZ, et al. Physiologic and antinociceptive effects of intrathecal resiniferatoxin in a canine bone cancer model. Anesthesiology 2005;103:1052-9. Caron JP. 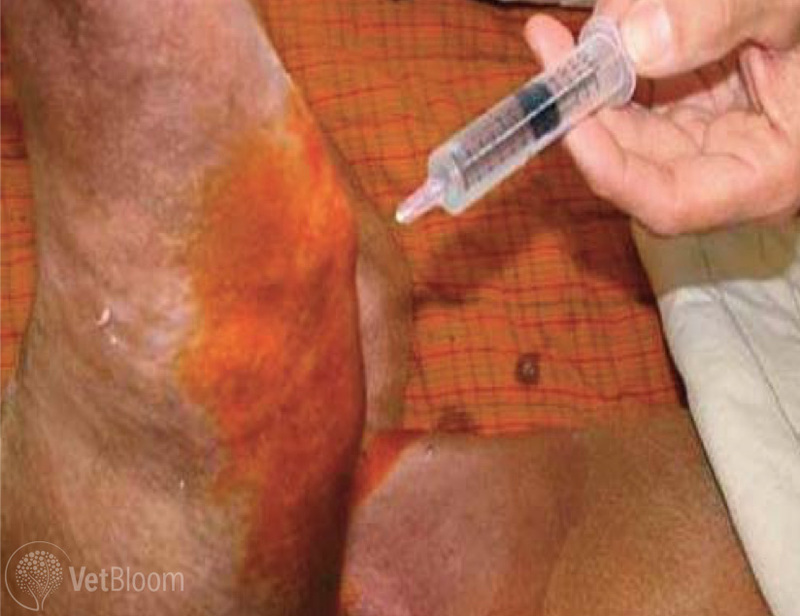 Intra-articular injections for joint disease in horses. Vet Clin NA Equine 2005;21:559-73. Case JB, Palmer R, Valdes-Martinez A et al. Gastrocnemius tendon strain in a dog treated with autologous mesenchymal stem cells and a custom orthosis. Vet Surg 2013;42:355-60. Manchikanti KN, Pampati V, Damron KS, et al. A double-blind, controlled evaluation of the value of sarapin in neural blockade. Pain physician 2004;7:59-62. Nielsen JV, Berg LC, Thoefnert MB et al. Accuracy of ultrasound-guided intra-articular injection of cervical facet joints in horses: a cadaveric study. Equine Vet J 2003;35:657-61.